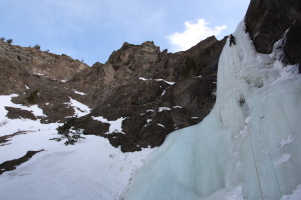 Me and Karén needed an ice fix and planned to spend a week in Cody, Wyoming for some ice climbing. At the bottom of this page, I have some beta about other climbers who want to do the same. We arrived uneventfully, despite flying in a dash 8 twin turboprop, one of which had crashed in Buffalo, NY just days prior to our flight (see wikipedia) due to frozen wings (under investigation, see wikipedia references). This was also after the door on our Boeing 767 froze shut on the SFO->Denver flight, and needed a mechanic to arrive and chip the ice away while we were stuck inside for 20 minutes. Were we worried about it? You bet! After all, you can't put ice screws in the sky to protect the airplane if it takes a dive. Anyway, the Cody airport is super cute and small (and we were very happy to have stepped on terra firma after the plane ride). We picked up our rental car and merrily went on our way to Super 8, our crashpad for the week. Day 1: Moonrise (WI 5) It was tough to get up early, so we got a fashionably late start and headed to High on Boulder & Moonrise at the end of the South Fork road. Since it was President's Day, I figured the place would be a zoo, and was worried abour late start - surprisingly, we were the only ones there. We could see the climbs from the car, and the approach went by pretty quickly - something that we should have enjoyed more at the time, in retrospect, because it was priceless when compared to the approaches we had to do in the following days. Karén took us up to the first ledge getting a feel for the ice, and I launched up Moonrise, eager to climb something already. The ice was pretty good and provided me with plenty entertainment. I belayed from a tree and enjoyed the views of the river valley, which really reminded me of the Ghost river in Canada (one of my favourite places in the world). I dragged my SLR up and took some pics of the valley with a big smile on my face. That night, we went to Aaron's store, and got some beta about One Arm Bandit and Ovisight which got us excited for the next days. Day 2: One Arm Bandit (WI 5) attempt Aaron told us the approach was in great shape due to avalanche debris in the drainage, and the pillar was in good shape. Aaron also noted he got hit by a small rock on the chin though and showed us the 5 stitches he got... somehow this wasn't a hint to us that we should go somewhere else, and we still went there. After all, it's described as one of the best routes in the valley, and the approach is in easier-than-averaga shape (if you haven't figured that out yet, I disagree). Indeed the approach was easy walking on top of debris, until it got icy and somewhat sketchy at the top (crampons would have been useful). We got there anyway, and Karén took us up the first two pitches in a journey of 75 meters (a tiny bit of simulclimbing with our 70 meter ropes). However, as soon as I got to the belay and was excited about the crux pillar, I noticed rocks were coming down every couple of minutes. It was a windy day, and we later found out that one should stay away from this place on windy days due to rockfall. Anyway, to make a long story short: while we were debating whether to keep climbing, another rock came down so we rappelled off and "got the hell out of there". Day 3: Ovisight (WI 5/6) attempt When I first researched this trip, one of my main objectives was to climb Ovisight, which truly looked like a spectacular climb in the guidebook. A grade 6 first pitch was followed by two amazing grade 5 pitches. In addition, when the first pitch isn't formed (which it wasn't), there is an alternative grade 5 pitch to that (Who's Your Daddy)- making for 3 great WI 5 pillars in succession. Sounds good? Only in our dreams, as it turned out. We looked at the climb with binoculars from the car, and saw the "approach" pitch had what looked like a snow roof/cornice and some missing ice. 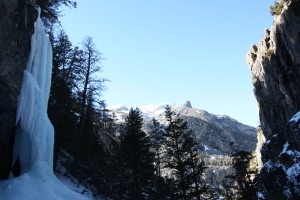 It was far away though, and when it comes to ice climbing, looks with binoculars are deceiving. Or... are they? So we decided to go take a look anyway. After a long slog up the drainage (the typical Cody approach), the pitch didn't look any better from up close. I decided to go up anyway, and take a closer look. Again, sometimes things are easier when you put your nose to them. 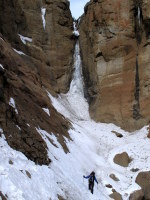 Six vertical feet from the snow roof (which was at least 4 feet deep), I found myself on a thin shell of ice which was falling apart, revealing a rushing waterfall underneath. After a few minutes of thinking how I could climb this, fueled by the thoughts of 3 spectacular pillars of climbing above, sanity prevailed and I downclimbed. I don't think it's necessary to express my disappointment, as anyone reading this would understand. Attempting to salvage the day, we tried to go to The Outdoorsman, but we ran out of time due to a long approach again. Eventually we cut our losses and went to eat at our favourite place again. Highlight of the day? We saw a herd of big-horn sheep which were pretty cool (and the climb name, Ovisight, comes from the name of the genus Ovis). Oh, and the soup of the day was amazing, as usual. Day 4: Mean Green (WI 5) Karén had attempted this climb on his first trip to the area about 5 years prior, but the crux pitch was chandeliered and they backed off. So we were back and Karén wanted to lead the pillar to settle his score with it. I took the first two pitches and linked them into one superb 80+ meter journey to reach all the way to a good tree on top (aerobic climbing). From there, we walked to the next two pitches (crux) and Karén tackled them uneventfully. 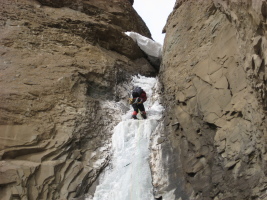 The upper slabs of easy ice didn't attract us enough, and we rappelled off from there. The score was settled and we finally felt like we climbed *something*. Day 5: Broken Hearts (WI 3+, illusions of more) We tried to get up early for this one, but by the time we were at the parking spot it was already passing 9:30am :( Another not-so-alpine start, oh well. Off we went, hiking up the drainage... again. However this approach is relatively short. 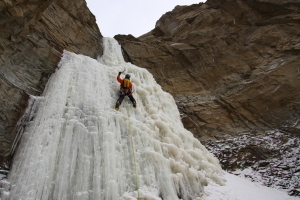 I linked the first two pitches again, and Karén took the 3rd pitch, which had some tricky ice. It was dumping snow and the sun was nowhere to be found, which was great on this south-facing climb (and that's why we picked it). 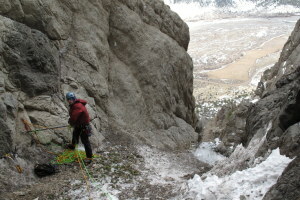 We dragged the ropes to another (4th) pitch, after which many steps of rolling ice took us to the upper amphitheatre that hosts the 5th pitch of the climb, My Only Valentine. The Carotid Artery (grade 6) was also formed and somewhat fat, and that's what we wanted to climb. Since Keith and Rich were on it, I started up My Only Valentine, only to find a soaking shower: I didn't even have goretex, and it was pretty miserable so I backed down and went over to the artery. Rich had just come down and said that the screws weren't so good due to pockets of air - the climb was aerated making for questionable protection. Sadly this discouraged me and Karén, and since it was already 3:30pm anyway (damn it, we should get an earlier start next time), we decided to head back down. We'll leave that one for next time, or perhaps we'll get strong enough to attempt the mixed climb in the back (as it rarely forms as a complete ice climb). Day 6: Roshambo (WI 5) We decided to go do Spying and Flying and Roshambo. Did we get an alpine start? I'll let you guess. The approach is flat, but the trail was icy, there was some post holing and it took us 2.5 hours to reach the climb. By that time, it was past noon, and instead of spending time on Spying and Flying, I decided to launch up Roshambo which looked great. The ice was pretty tricky for the first half, aerated and dry, so I had to do a lot of cleaning. 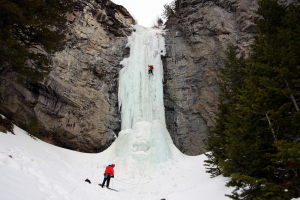 Lots of fun though, and I reached the top of the ice from where I belayed Karén up. Would have been nice if it was a bit longer, considering our lengthy approach. In the meantime, the other party came and started on the WI 3 Spying and Flying pitch... we decided not to bother with that one, and again cut our losses. The hike out was a slog, no more needs to be said. At least we didn't run into the cougar whose tracks we saw in the morning - how's that for something positive? And the pillar was nice. Of course, we looked forward to the "soup of the day". Day 7: Moonrise & Pillar of Pain (WI 5) It was our last day, and we wanted smaller approach and more climbing. Thus we headed to Moonrise & High On Boulder again, with the usual late start. We didn't know if the Pillar of Pain higher up the drainage was formed, and aimed to find out. There was another party at the base ready to start climbing, but they were doing High On Boulder, so we were going to be out of each other's way. I was also happy this allowed me to take some cool photos. I ran up to the ledge by taking the right side, and setup a nice belay before bringing Karén who then headed up the pillar. The climbing was very nice again... I did the 3rd (easy) pitch and then we went 50 feet higher up the drainage before traversing left to regain High On Boulder via a traverse left over some trees. From there we climbed up easy ice and hiked to a 15-meter step of WI 3, which led us to the Pillar of Pain - it looked nice! 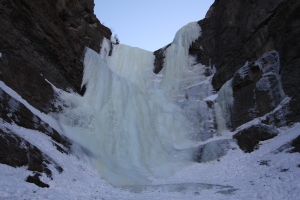 Like all ice climbs, it looked intimidating from a distance, but once up close, all kinds of features revealed themselves making it look very approachable. I was psyched to get on it, and after fueling myself and getting a quick drink, I didn't want any longer. 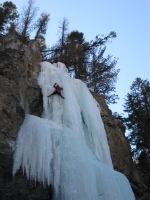 The climbing turned out to be steep but pretty easy, mostly due to the friendly ice quality and a groove. David and Sandy from the East Coast (the other party) arrived shortly after us, and David also led the pillar. We later met at the Proud Cut Saloon, which we highly recommended, and socialized - cheers guys and thanks for the entertaining stories! Thanks for reading, and happy hiking "up the drainage"! Cody beta: It's a small town, not much to know. If you haven't figured it out already, do yourself a favour and go to the Proud Cut Saloon! The road is nice, so there is no need for renting an SUV for most places, a car does just fine (if you want to save money). Hotels/motels.. there seem to be plenty, we liked the Super 8 as it had breakfast. There is also a grocery store (Albertson's) which we frequented. Get the guidebook, Winter Dance slog. Visit Aaron's store, Cold Mountain Sports. Feel free to email me if you want to know anything else!